215 hookups/weekend for their family's boat where the fish average 13 inches, like Dale (our president/founder) actually does. 120 hookups/weekend for your family's boat where the average trip has 7 pound fish. Have your average fish over the whole year be 33 POUNDS if you fished all of our top 35 biggest-fish scenarios. 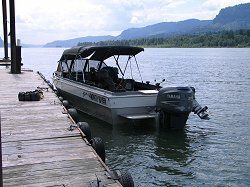 Averages 19 hookups/weekend for your family's boat (sturgeon and halibut may be higher, tuna and Chinook likely lower). Virtually not get skunked for a whole year if you only fish from the 64 scenarios on our "No Skunk" Guarantee list. Dale's boat hasn't been skunked in years. We'll tailor our computerized Fishing Calendar for each member, so they'll enjoy fishing more. Extensive written "Game plans" and instructional video clips, for specific catching scenarios, on our web site. We seek out experts, like Dave Graybill. We'll give members the best Fishing "Reminder List" we've ever seen…makes for the smoothest trips possible. Personalized instruction by phone, or email. Latest News emailed to you, or access it at this web site. Reports/pictures from our latest fishing trips. Email or call us for advice. Members' volunteer or monetary contributions help us "give back" to the fishing resource. "We're not just fishing, we're catching!"